A walk in the bush, provoking kids to think! It’s Friday afternoon, it’s warm and it’s the last lesson of the day, and I have a restless year 9 Science class. Another teacher and I decide to take our two classes out to teach some ecology using a story. The story is a traditional dreaming story from the D’harawal people from the south of present day Sydney. It tells the story of three beautiful sisters, with golden hair and green eyes and the warrior who thought he was a ‘clever man’ who wanted to marry one of sisters. The sisters were very similar in appearance and to marry one all the warrior had to do was to find a way to tell them apart. After years of careful observation he fails, the sisters grow old and die and are rewarded for their faithful service to their people by being transformed into three different wattles which continue to provide for the people. The warrior has it revealed to him that the only difference in the three sisters was the shade of green that coloured their eyes, if only he had been more observant! I have told this story before, with other groups, but usually I tell the story while scratching aboriginal symbols in the dirt or sand on a bush trail, to represent the different characters of the story, and I pick leaves from different wattles as I walk and place them on my dirt picture to represent the different eyes. Today was different, the students were obviously suffering Friday afternoon, restlessness and we did a long walk to a shady spot on a rocky outcrop in the National Park, to help reduce the restlessness. With no dirt patches I resorted to getting students to act out the story as I told it. 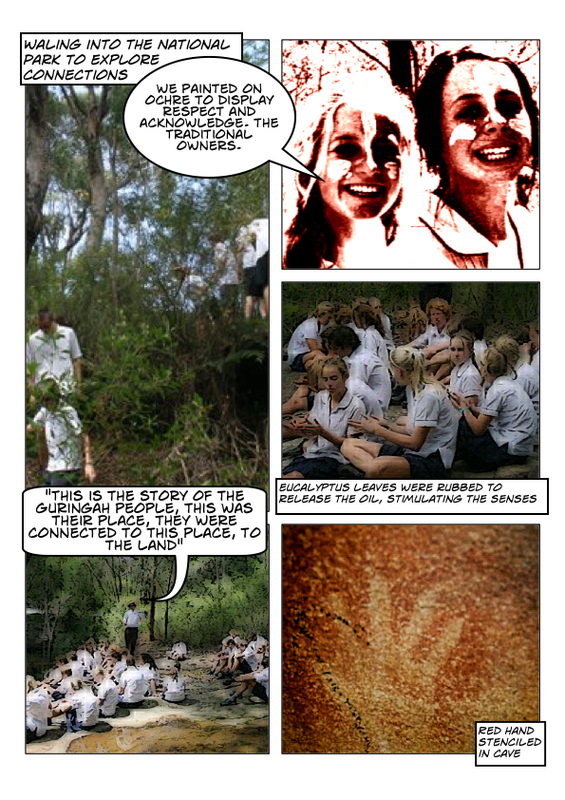 The immediate result were the same as previous telling’s of the story; students were able to point out a number of learning outcomes for the story such as the importance of careful observation required to survive in the Australian bush, the complexity of bush land ecology and there is always a wise female student to point out the arrogance of the warrior and his need for humility. The thing that stood out on this occasion was not the different approaches to recounting the story, but the reaction of some students on the walk back to school. Having walked out further than we normally do, we had a longer walk back. This allowed time for those students that wanted to know more to ask. I walked back with a large number of students wanting me to point out what there was to observe in the different plant communities along the track and to add as much information as I could. The questions and reflections of the students surprised me, the activity had produced far greater reflective thought than you achieve on most Friday afternoons. Months later students can still recount that afternoon, and often ask if we can get out and go for a walk, now all I need are some good stories that help explain atomic theory. 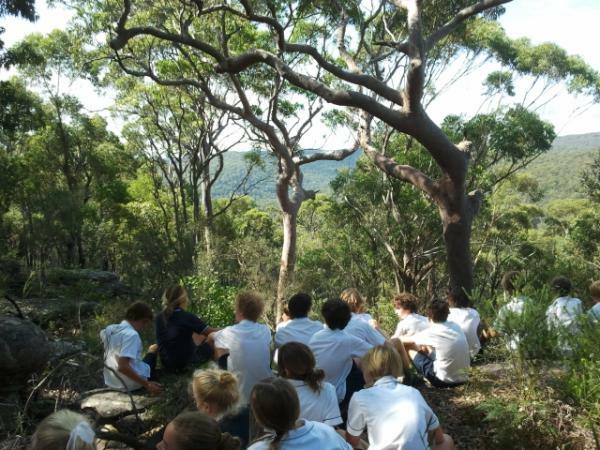 This post describes the second part of an introductory lesson to our year 9 Ecology topic. It uses the technique of teaching with narrative. A description of the first part of this lesson is found here and an overview of the inspiration for using narrative teaching is found here. In small groups students discussed the journey into the National Park; each member was able to build on the memories and reflections of others to help construct the whole narrative. As I wondered around the groups I was amazed at the level of recall that was present, including details I had not noticed. The groups where then asked to present their recount to the whole class. But rather than doing this verbally they were ask to create a recount using only symbols. Some traditional symbols from aboriginal storytelling and explanations for them were given. Examples included animal tracks left behind in the dirt, the symbol for a human is also often a representation of the impression their bottom and tools would leave where they had sat on the ground, waterholes and campsites. Students were also encouraged to develop their own symbols using similar thinking process, but no words were allowed. Each group then presented their narrative recount to the whole class. Finally students were given time to reflect on the purpose of the narrative and record it how they saw fit in their workbooks or in a document on their digital devices. 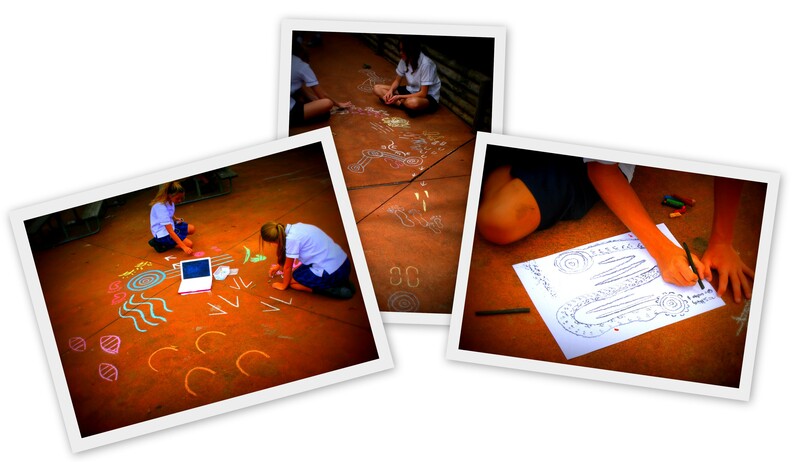 In this case many students took digital pictures of the narrative they had produced with the symbols. Here is a description of the first lesson in our year 9 Ecology topic. It uses the technique of teaching with narrative. The lesson was split over two learning sessions. The first described here took the students on a journey into the national park that adjoins our school. A note about context: Our school is on the Northern Beaches of Sydney, Australia. Although there are a handful of students with aboriginal heritage the majority are representative of the area, being made up mostly of both recent and early immigrants with European cultural backgrounds. Most have had little exposure to indigenous cultures. The journey into the national park started with an acknowledgement of the traditional indigenous custodians both past and present. Students were painted up with ochre on their foreheads and hands to acknowledge respect for the people and land we were entering. They were informed that it indicated we come with in peace and with respect, we would not travel to places we were not meant to go or touch anything we were not meant to touch. This was reinforced with a reminder that we were entering a national park and we take nothing but photos and leave nothing but footprints. The group then made its way to a rock platform that has a permanent small creek flowing over the surface and off an overhang as a small waterfall. Students invited to have sit on the rock and encouraged to scrunch up and role a gumleaf in their hands to release the eucalyptus oil, taking deep inhales of the oil and thus stimulate their sense of smell, an activity carried out by indigenous children to help retain memory of stories and lessons taught. Axe grinding groves where pointed out in the creek and a description of aboriginal connection to place and the significance of fresh waters sources was explained. This was linked to our study of ecology and the interconnectedness of life. Students were then invited to climb around and under the overhang where there are a group of ancient aboriginal stencils of hands and tools at the back of the cave. While these were being pointed out and examined by students again a further explanation of aboriginal’s connection to the land and place where emphasised as was the need for deep respect for such ancient artwork. Finally as we returned up the hill to the school, aboriginal recognition of the significance of observational science was discussed, such as the use of plants for food and medicine and an understanding of approaching weather and rain that can be gained from observing ant behaviour. Last year I had the privilege of spending half a day in the company of Frances Bodkin (Aunty Fran), an elder of the D’harawal (an aboriginal language (tribal) group of south-western Sydney). The time spent with her and her husband Gavin Andrews was focused on her knowledge of the aboriginal uses of plants, but it revealed so much more. I think the thing that struck me most was the traditional knowledge they held and graciously shared, based on thousands of years of their ancestors’ observation, can be backed up and explained by today’s ‘western’ experimental science. Aunty Fran describes her people’s knowledge as Aboriginal Science, which I think is very appropriate, and I hope her dream to share this knowledge and have it fully acknowledged comes to fruition. Her book D’harawal Seasons and Climatic Cycles is a great starting place to begin to appreciate the depth of knowledge and understanding her people have to share. Black science has observation and experience, white science has measurements and experiments. If we put the two of them together we’d get a much deeper science. In the last 5mins of my time with Aunty Fran she discovered I was a school teacher and told me about a research project she had been working on in schools using stories to teach. Her methods were based on traditional aboriginal teaching methods, from an oral culture that had no written language other than the symbolic art found painted in caves and engraved on rock platforms. Personalisation: recording your personal record of the learning. These are all aspects that dominate the research literature on how people learn. I have instinctively included elements of story or narrative in my lessons. I think statements like “the way humans learn in the C21st has changed” are misleading. Humans now have an array of technology to assist learning, but my gut feeling is that at a biological level we still learn the same way we always have and that the reason narrative is a part of all ancient cultures teaching practices is because that is how our brains are wired to learn. The narrative helps us link new concepts to old and allows us to remember the important bits associated with the story. I would also make the bold claim that all children learn similarly and that taking an ancient aboriginal approach to instruction should also work with non-indigenous children. I have since experimented with my own classes and developed a unit around the ecology we teach to year 9 students. I will recount my experiences in future posts.